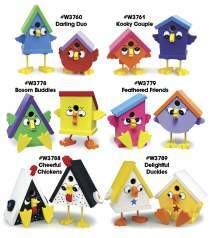 Our comical "Friendly Bird" birdhouses are quirky and adorable! You can decorate your yard with these colorful birdhouses and make a home for live birds, or display them indoors as a conversation piece. Build them from 3/4" lumber. Order 4 eyes, 1 dowel and wire (if hanging the projects) for each plan set separately. #W3760 Darling Duo, #W3778 Bosom Buddies & #W3789 Delightful Duckies use the #1783 Eyes and #W3761 Kooky Couple, #W3779 Feathered Friends & #W3788 Cheerful Chickens use the #8762 Eyes. Birdhouses range from 9-1/2" to 15-1/2" in height.